During a Chinese Super League match between Liaoning Whowin FC and Chongqing Lifan FC, Lifan's goalkeeper decided to take a sip of his water right after his club conceded a free-kick just outside his box. 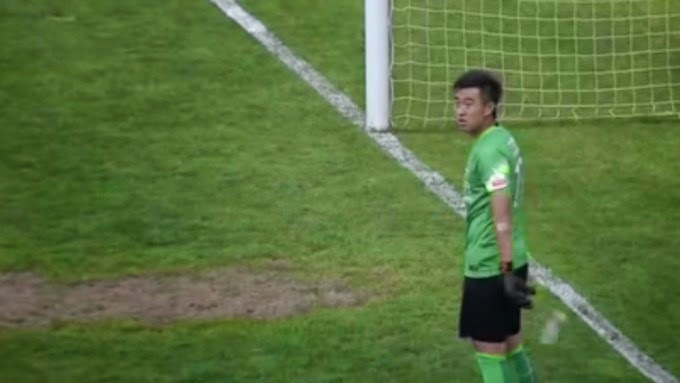 But the opposition were smart to restart quickly and a speedy pass into the box found Liaoning midfielder Ding Haifeng who put the ball in the back of the net as Lifan's keeper Sui Weijie was obliviously taking a sip from his bottle. The clueless shot stopper was caught off-guard and when he realized what has just transpired threw the bottle to the sideline, only the ball had already been inside his net for a god few seconds. It was later discovered that Weijie was fined by the club a whopping 50,000 yuan, which is equivalent to about $8,000 (USD), surely not pocket change for a player who's salary is likely to be less than $100,000 for the entire year. Despite the fine and Weijie taking full responsibility for the atrocious mistake, saying "I made a terrible mistake in Sunday’s game and let go a full three points. I won’t repeat the same mistake and will never lose concentration. ", he is still in danger of being suspended by the club which has had a rough start to their 2015 campaign having picked up just 10 points from the first 10 matches and are currently sitting one spot above the relegation zone.